Coeliac disease is extremely complex. Not all patients who develop the disease display the classic gastrointestinal symptoms which contributes to under-diagnosis and unnecessary distress. The majority never receive the correct diagnosis and treatment. Those diagnosed often spend years seeking answers before receiving the diagnosis. 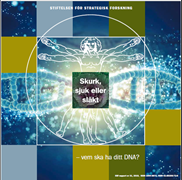 In conjunction with Associate Professor Anneli Ivarsson, M.D., consultant at Umeå University and Västerbotten County Council (a health authority in Northern Sweden), we hope this brochure will increase your awareness and knowledge about coeliac disease.